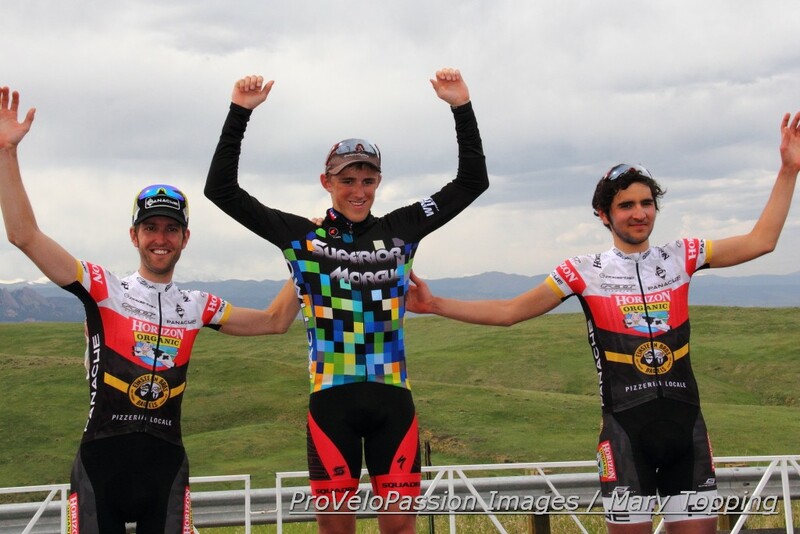 Combining strategically placed prize money, a tough course, and an interesting field containing a previous two-time winner delivered one complex, awesome day of bike racing at Sunday’s men’s pro-1-2 road race in the Superior Morgul Classic. The race concluded three days of competition in the fourth edition of the Superior Morgul Classic. The highlight of the event, the route traced a portion of the historic Morgul-Bismark circuit, ending in the same place as the Coors Classic stage at the top of “the wall,” a mile-long climb with the steepest estimated 12% grade near the summit. This year the pro-1-2 men completed six laps of an out-and-back course for a total 73 miles and 4,500 feet of climbing over three hours. The day’s difficulty warranted a deeper purse than the previous time trial and criterium rewards. With that purse also larger than the overall three-day omnium prize, the win represented an attractive target, for some more valuable than the palmare of a local stage race first place. Other factors further complicated tactical decisions in the field. Going into the road race Fabio Calabria (Horizon Organic/Einstein Bros) held a slim lead in the omnium, one point ahead of Gage Hecht (Team Specialized Racing) who had upgraded to cat 2 after winning the cat 3 Tour of Gila earlier in the month; three other riders were placed within four points of Calabria’s lead. Also, Horizon Organic/Einstein Bros possessed additional cards to play. After his victory in the criterium on Saturday Emerson Oronte stood within striking distance of the omnium lead. Chris Winn had won the road race twice before. As if that wasn’t enough to make things interesting, the field contained many freelancers without teammates who could form secret alliances. Finally, anyone who didn’t drink or fuel enough under the hot sun could suffer from cramps or simply blow up. With all of this in mind, seventy riders rolled away from the road race start line on Sunday morning. Early on Scott Tietzel (California Giant Cycling Team) and Kevin Nicol (Natural Grocers) tested their legs in a two-man breakaway. 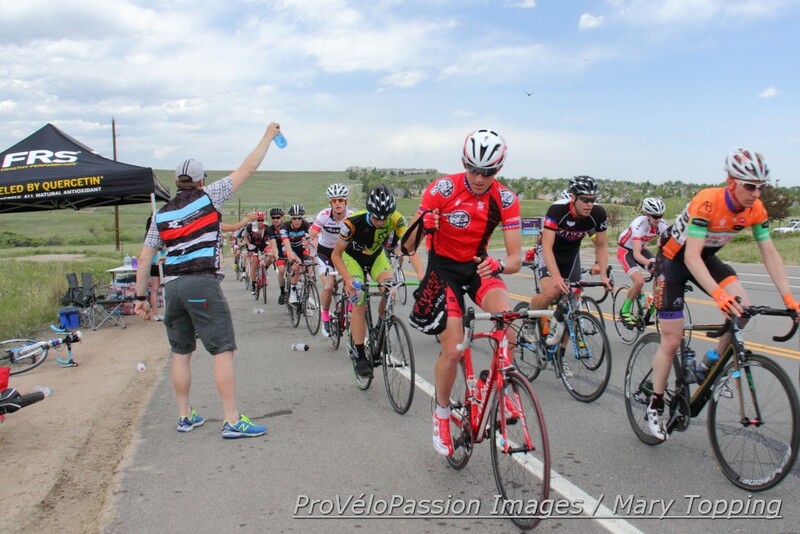 Seven riders formed a chase group: Ian London (Primal-Audi Denver), Jonathan Toftoy, Leroy Popowski (Juwi-Slipstream), Kit Recca (Horizon Organic/Einstein Bros), Jon Moro, and Riley Majeune-Fagan with one of his Rio Grande teammates. Horizon Organic/Einstein Bros men guided the peloton, Calabria inserted safely after them. With the break containing no significant threats to the overall as well as one of their teammates, the Horizon boys didn’t need to chase overly hard. But unfurling too much leash could hurt Winn’s chances at a hat trick. In the third lap the two groups off the front consolidated and shed a few guys. The main field chipped away at the break’s advantage of 90 seconds in the remaining three laps, reabsorbing all but three while shelling fatigued riders. Hecht rode in the pack, biding his time. Just four omnium points shy of Calabria’s total, Taylor Shelden (5-hour Energy p/b Kenda) later said he launched attacks but couldn’t stay away. The remaining front-runners – London, Recca, and Jon Tarkington (Natural Grocers) were pulled back during the final lap’s trip west toward the Flatirons and snow-topped Rocky Mountains. Once again Shelden went for it, this time on the climb coming back east. He flew around the corner and under the finish line with about half a lap remaining. Maybe the Aussie could have waited for other riders high in the standings to respond to the real threat of a feisty Shelden. Or maybe the others were worn down by five trips up the wall and the thought of one more. Whatever the reason, as Calabria took that corner his face resembled one of a man thrilled to be aggressively in the hunt. The pack arrived a little over ten seconds later led by a Rio Grande rider, Maxx Chance (Panache), Michael Burleigh (Primal-Audi Denver), and several Horizon Organic/Einstein Bros men next in line. Burleigh had started the day third overall in the omnium competition. Before the final climb up the wall everything came together in the fastest of the race’s six laps. 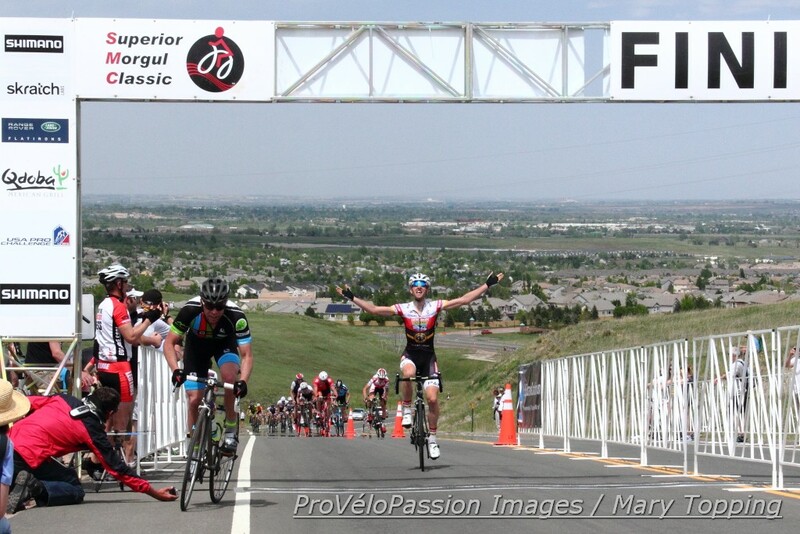 Winn stepped on the gas with 200 meters to go and claimed his third victory wearing a wide smile as he crossed the line five long seconds before eighteen year-old Bissell Development’s Keegan Swirbul. The master of the Morgul-Bismark wall said gaging his effort on the final ascent helped him score the win. As Winn caught his breath he replied to a question about the possibility of the sixteen year-old Hecht coming away with first in the omnium. In the road race Hecht got third just over a second after Swirbul. Shelden arrived in twenty-sixth place. Calabria, Oronte, and Burleigh finished in the top ten, but short of points to claim first overall in the omnium. That prize would go to Hecht, with Oronte and Winn completing the omnium podium in second and third. The junior’s good fortune came as a bit of surprise since he’d finished ninth in Friday’s time trial. While the omnium points were tallied the junior waited on hallowed ground with his family and over 100 athletes in the same place where Bernard Hinault and Greg LeMond stood almost thirty years ago. 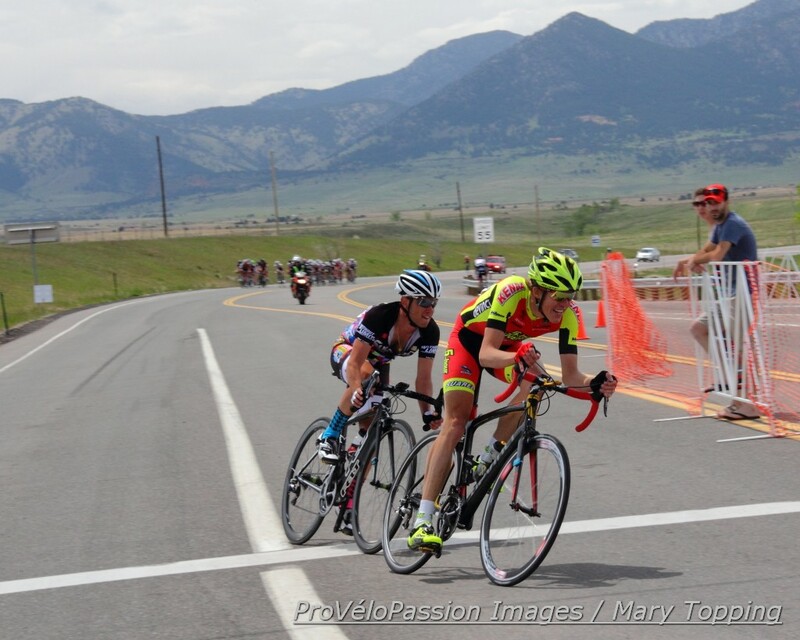 For full results see the Without Limits or Bicycle Racing Association of Colorado websites.